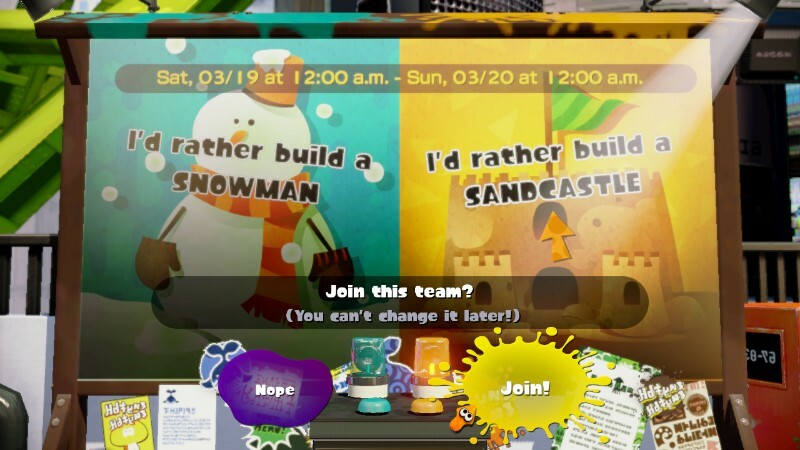 KoopaTV: Build a Snowman or Build a Sandcastle? By LUDWIG VON KOOPA - Which will the Mexicans pay for? Marie/Team Sandcastle supports Tom Clancy's The Division and division in general. Great! 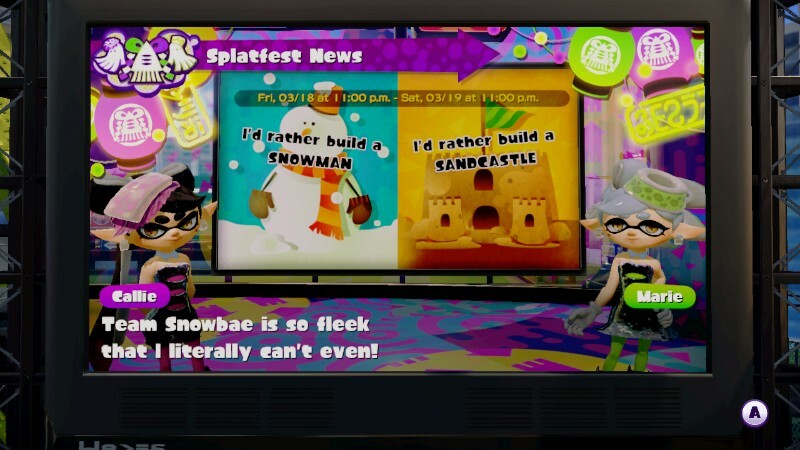 Callie/Team Snowman supports talking like a fleek freak. 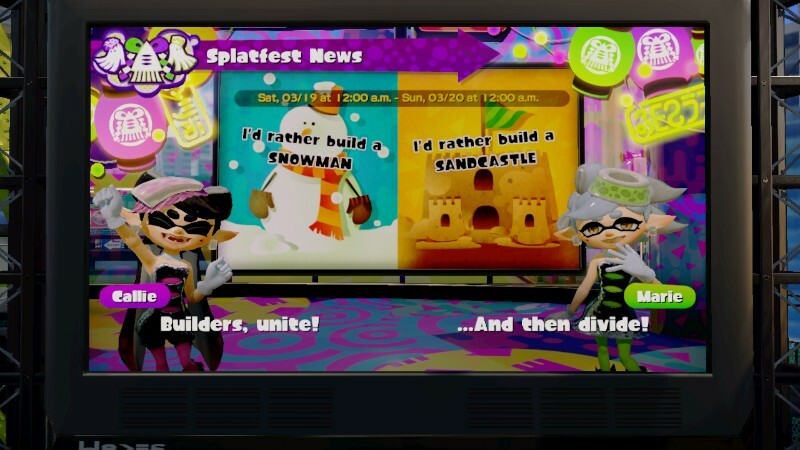 It's critical to note the gendered nature of Callie and the Splatfest. You're being asked if you'd rather build a snowman or a sandcastle... The latter is fine, but what if I wanted to build a snowwoman? In Kirby: Triple Deluxe, Kirby is tasked with putting snow people (a husband and a wife?) together in Old Odyssey. 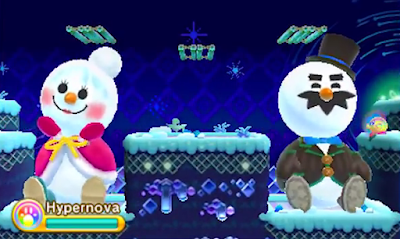 In Animal Crossing: New Leaf, there is a whole Snow People family of Snowman, Snowmam, Snowboy, and Snowtyke. Next game: Crossdressing/transgendered snow people. Progress. Now, listen. I don't have any personal connection to snow folks or sand castles. In my world, there's Mizzter Blizzard, and the Sand Portal, which is a magical sand castle. A person didn't really build it... it's on Gelato Beach and it appears when a certain Dune Bud is sprayed. You might remember it from Super Mario Sunshine, but I never visited the place. Bowser Jr. did. I've only heard about it. Mizzter Blizzard is a loser, so I don't really care about him. Lost more than Marco Rubio. In general, I'll say I prefer the beach to some winter wasteland. Winter wastelands remind me of Sherbet Land (from Mario Kart 64) in Mario Kart Wii, which every biker picked online because it was a wide-open space where you just do wheelies. I don't think there's any snowmen or snowwomen there. Just ice and malicious penguins. 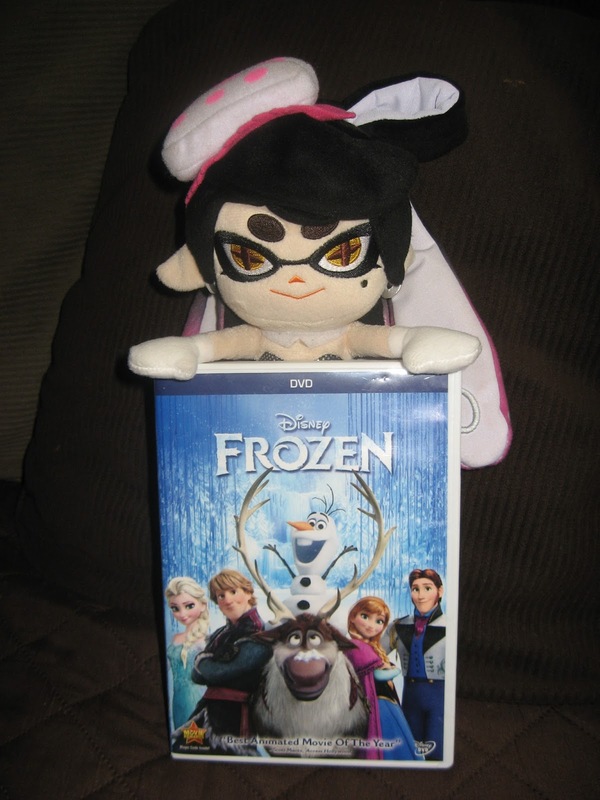 Callie the Inkling holding up a DVD of Disney's Frozen. Picture provided by ShinyGirafarig, for KoopaTV's use. So. Team Sandcastle. Let's go. All you need is sand and water. For snow, you need a specific kind of snow or it won't work. It just won't work. This makes building anything with snow a hassle. Not a fun activity. Your hands/gloves/mittens will be all wet and gross by the end. Well, one of those permutations is an igloo. Yup, Mr. Sandman from Punch-Out!!. That's a knock against sand and a knock against men. At least sandcastles are gender-neutral. And Mexico will pay for its construction. ...Seriously! Mexico players will mostly be on Team Sandcastle! We love the Mexican people. They just don't contribute any readership numbers to the site. Ludwig hasn't actually chosen a team in-game in Splatoon as of publishing. You can try to change his mind before Saturday. The way this article was written is indicative about how little Ludwig cares about this Splatfest theme. The Splatoon Splatfest updates announced from the Nintendo Direct two weeks ago is going to apply. Read about that Direct here. For the previous write-up covering a Splatfest, and one Ludwig put more effort into, read about Pokémon Red vs. Pokémon Blue. 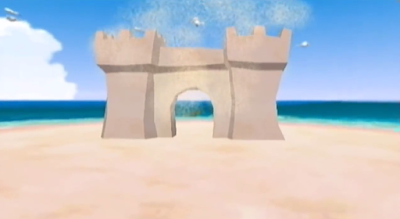 Well, now there's a sandcastle Pokémon. This guest poster sounds like he'd be on Team Sandcastle too. ...But this guest poster wrote about Frozen II, so probably a Team Snowman guy. "[The Mexican people] just don't contribute any readership numbers to the site." I'll have you know that I myself am of Mexican heritage. In relation to the Splatfest, Mexican players are very competitive! I know from experience! Also, Frozen is overrated. It's an overused meme, after all. KoopaTV doesn't get readership from people who have Mexican IPs. ...Yeah, so I'm not sidin' with it. I like to think that the "man" of "snowman" is supposed to be gender neutral as the word "man" used to be like its use in the bible. People say the Bible supports THE PATRIARCHY, and that's a reason. You don't see Judeo-Christian feminists. They should have just made it Winter vs Summer to make it as gender neutral as possible. But then all the kids will chose Summer because "no more teacher's dirty looks." I would have chosen "Winter" because when I get off for Winter break from college, there were barely any annoying kids around and I would put up with the cold just for that. ...I like summer because winter is horrible. Cold is bad. The worst thing about summer is the mosquitoes. I have to use repellent nearly all summer, even at home because those things know how to get inside and not only take my blood but make me itch afterwards. You can blame the environmentalists for why they ain't eradicated! They are an invasive species in America. Environmentalists are supposed to eradicate them in America. And if environmentalists don't want to kill them off because they help pollinate flowers or whatever other excuse they have, we already got more benevolent insects like butterflies and at least bees give us delicious honey even if they do sting. Bees anyway are supposed to only sting as a last resort as it kills them in the process. ...Well, go get an environmentalist in this comments section and see wot they think. The best teammate I had for this Splatfest was from Mexico. What meaning can I get from this? My family threw a surprise party for my mother. One of the kids gave her a present in a gift bag which had stickers pasted on it. One of the syickers said "On Fleek". I am so glad Nintendo of America had made a talking, long tentacled cephalopod use such a word so I can learn what that means or else I would be bothered about what that word means at the party. That garbage is on stickers now? I blame Sticker Star for the decrease in sticker quality. I'm so glad Sandcastle won.